Fairy tales are just for little kids, right? Not in this Caldecott Honor book, where ten hilarious stories turn the familiar lives of fairytale characters inside out and upside down! In these slapstick stories, the ugly duckling grows up to be ugly, Cinderella rejects Rumplestiltskin, a princess gets a mouth full of slime after kissing a frog, and Little Red Hen and the giant share goodies at the top of the beanstalk. Bursting with twisty bits, nutty chuckles and zany illustrations, these wacky mixed-up stories beg to be read again and again. 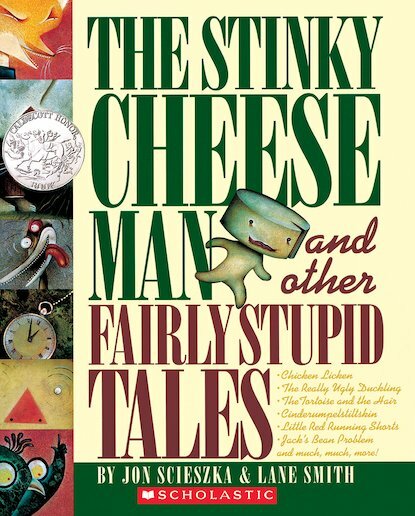 Jon Scieszka’s awards include a Caldecott Honor Award for The Stinky Cheese Man. Lane Smith’s awards include a Caldecott Honor Award for The Stinky Cheese Man.